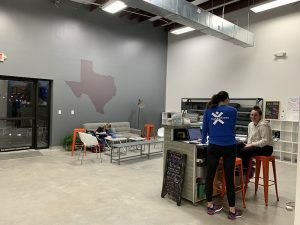 Yoga Athletex, sitting directly above the Houston Skyline Juniors volleyball gym in Spring Branch, has a mission to help prevent sports-related injuries. 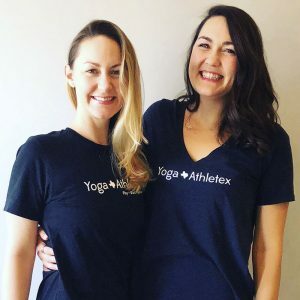 Founded in January of 2017 by sisters Kalynn Evans and Patricia Bomar, Yoga Athletex seeks to provide the movement training that Kalynn thinks could have prevented her own injuries she suffered while playing college volleyball. “If I had practiced yoga in college, I may have been able to avoid injuries, and could have kept playing, even after college,” says Kalynn. I climbed the steps to the second floor (my daily workout) to reach their modern-industrial style space, compete with a yoga studio, workout gym and a locker room. A group doing High Intensity Interval Training (HIIT) hustled purposefully through circuit stations set up in the gym, under the supervision of their trainer. 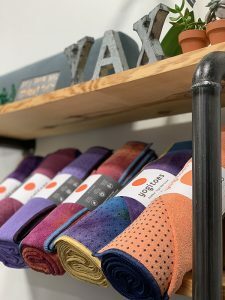 I stepped into the peaceful calm of the yoga studio to speak with Kalynn about the story behind Yoga Athletex. “We grew up in the fitness industry, and we had always dreamed of opening a business together,” Kalynn says. The sisters’ immersion in athletics growing up was partly due to their mother, who played volleyball for University of Houston, then the United States Volleyball Association, and now works with PE teachers in Spring Branch. Patricia played college club sports while working toward her sports management degree, and Kalynn played college volleyball while studying accounting. “I suffered from a lot of injuries in college, and my doctors told me that I could do yoga and I could walk, and that was pretty much my limit for movement,” Kalynn says. On her doctor’s recommendation, she began taking yoga classes consistently. After 30 days of yoga, her back pain had gone away, and she no longer needed to take medication. “Doing yoga increases your mobility, flexibility, and range of motion; keeping you from compensating in other areas during workouts and causing injury,” she explains. Kalynn knew that she had to keep up this routine. After college, both sisters found jobs in the oil and gas industry. However, Kalynn explains that being a very kinesthetic person made sitting at a desk for 8 hours every day far from ideal, and the sisters found joy in their workouts outside of work hours. By 2013, Patricia and Kalynn decided to become certified yoga instructors, and started teaching classes under their newly formed LLC, Yoga Athletex. “We taught in parks, our parents’ garage, we rented space in a CrossFit gym, and inside the Skyline gym at first,” Kalynn says. When Skyline offered them a space on the 2nd floor, “We felt like it was now or never – take this opportunity or go back to our day jobs. It was an opportunity we couldn’t pass up,” Kalynn says. Accepting Skyline’s offer in January of 2017, Yoga Athletex has gone from Kalynn and Patricia as sole instructors, to gradually adding a staff of highly qualified trainers over the past two years. The sisters’ mission began with youth athletes, who Kalynn often recognizes are “very stressed out with recruiting, school work and even social media. They have a lot on their plates.” The sisters can thoroughly identify with the challenges faced by these students, having once been in their shoes. High school and college athletes can benefit from the “Play, Work, Restore” model that Yoga Athletex upholds. “Play” refers to the athlete’s sport, “Work” happens through cross training (HIIT), and “Restore” is achieved through yoga and breathwork. Now, Yoga Athletex works with athletes from age 11 through adulthood. Current athletes and people who participated in athletics at any point in their lives can find support through classes offered. Functional Movement screens are done on all athletes, to identify weaknesses each person can work to improve. Strength training classes, High Intensity Interval Training (HIIT) classes, jump training, sport performance classes, and mobility through self-myofascial release (therapy balls that increase your mobility), are part of the “Work” portion, before moving into a restorative yoga session. “I feel really lucky and find it extremely necessary that we get to offer a space for athletes to relax and recover,” Kalynn says. Spring Branch’s Yoga Athletex offers a supportive space for student athletes, competitive professional athletes, adults training for marathons, college graduates in need of a new fitness routine after transitioning from sports into working life, or anyone who wants to improve their health. Whether you play a sport, or are seeking to simply work and restore, Yoga Athletex creates a community with the tools to help you to reach your goals. This March we celebrate our February Athlete of the Month, Danielle Devine. Danielle truly embodies what it means to PLAY+WORK+RESTORE. Danielle is an endurance athlete and recently set a new PR at this years Houston Marathon. 4:00:08! She utilizes our HIIT and yoga classes as a means of WORK+RESTORE to supplement her sport. It seems to be serving her well! My main activity is running. I love Yoga Athletex so I can cross train and compliment my running. Last year I spent just as many hours running (258 hours) as I did cross-training in HIIT and yoga classes (251 hours) and I never felt better!! (258 running hours was 1,650 miles ran for the year!) As a result of my training and cross-training, I was able to improve my marathon time this year by over 9 minutes! I am stronger both physically and mentally as a result of the classes and community at Yoga Athletex! Running – marathons, half marathons, 10k, 5k, even a 50k! 75 minute Yoga for Athletes on Sundays! I love this extended weekend class! Elizabeth makes you feel like yogi gold! I leave feeling refreshed and ready to start a new week. Yoga Athletex is a wonderful community. You are not just a name in a big corporate structure. You are a real person with real goals, hopes, dreams, and concerns. You are treated with genuine kindness, caring, and thoughtfulness. The instructors and owners know your name, treat you with love and are always available to answer any questions or just to chat. Today marks the beginning of the March 2019 BALANCE CHALLENGE! Inspired by Aristotle’s Golden Mean, which articulates the importance of finding a balance of morals, and in this case a balance of your physical well being. YAX has worked to create an environment where you can succeed in balancing a wellness routine between Yoga, HIIT, Mobility and Rest. This month our challenge for you is to take the SAME amount of yoga classes as HIIT classes for the month of March. Everyone who completes the challenge will receive reward points dependent on how many classes they take. Anyone who take 10 or more of each yoga and HIIT classes, will be entered into a drawing to win a FREE FMS Screen or Re-Screen! Find your balance this month! Are you a fitness or yoga instructor looking for a unique organization and team to work with? Do you enjoy serving in the spotlight? Are you passionate about movement and teaching? Do you love cleaning equipment after a sweaty class? If you answered yes to all of these (except the cleaning one—we hate that), we’d like to talk to you. We’re looking for a confident, professional and experienced instructor to join our Coaching Team. We’re growing like crazy, and we’re looking for someone who can jump into a system quickly while contributing their own magic touch. We have a number of exceptional coaches who reach hundreds of people each year with the message of ACCOMPLISHMENT. Help us continue spreading that message. Join our crusade to change lives forever! • Broad knowledge of anatomy, functional movement and breathwork. If you just like to look at yourself in the large mirrors at the gym, please don’t apply. • Experience in teaching small groups. This means less than 10 people in a class. • Ability to think on your toes. Understand that quickly means QUICKLY— you won’t have time to google it! • Eat pressure and high-intensity situations for breakfast. • Work directly with youth and adults to help them achieve their fitness goals. • Encourage membership sales of every person that walks through the door. • Be able to do necessary administrative tasks. Check clients into your class. Run a timer. Bring the (non-explicit) heat with your playlists. We all have to do ’em; make sure you can do them accurately. • Of course, actually coach and/or teach yoga. You may have open/close the studio, wipe down equipment, check someone out for a water or sweat towel, or collect payment for private lessons. Can you do these things with excellence? If this describes you, we want your résumé! We are bringing back the Athlete of the Month award at Yoga Athletex for 2019! We want to use this platform to showcase our amazing members who put in so much personal work at our studio. We may be biased, but we have some of the greatest athletes training at Yoga Athletex and we want you to know about them. Some of these members are youth athletes working towards athletic & academic scholarships, some are former college athletes, trying to stay in shape and maintain their active lifestyle while transitioning to the working world, and some are adult athletes that are competing in marathons, triathletes or just wanting to move well, and move often. We love every single one of our members and want to take the time each month to stop and recognize their accomplishments and hard work. First on deck for 2019 is… Logan Lednicky. For January, we nominated Logan Lednicky who is more than deserving of this! She is a volleyball athlete and has been training at Yoga Athletex since the beginning of 2018. We have been able to watch her grow as a young lady and watch her grow as an athlete & it has been very heart warming. We’ve had the privilege of getting to watch Logan play volleyball in her high school playoff game this past season, where she was a freshman starting on the varsity team! She comes to Yoga Athletex to train like the competitive athlete she is, with lots of determination, and we have seen the payoff. We love watching her better herself through not only jump training classes, but also restorative yoga & mobility classes. We asked Logan some questions, and wanted to share them with all of you, so you can get to know her a little bit more. I have been training at Yoga Athletex for a little over a year. I have increased my vertical at least 4 inches, gotten rid of old knee problems, and gained a lot more endurance. My favorite class is jump training because it targets volleyball specifically. I have gotten so much better at using my power in to jump up rather than out which has helped me so much on the court when facing big blockers. At first the classes will seem really hard, but don’t stop. Just keep going as much as you can and it will get easier over time, and once that happens you can push yourself in the workouts even harder. 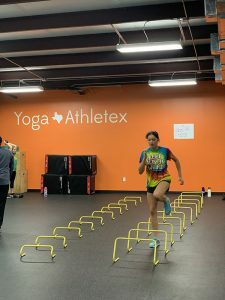 I started coming to YAX to increase my vertical but by taking the the other yoga and mobility classes it has helped me get faster on the court, become more flexible, and improve my form. Here at Yoga Athletex we put an emphasis on injury prevention and joint stabilization exercises. Today we are going to take a look at our shoulder. We will gain a better understanding of the difference between a labrum tear and a rotator cuff tear. Your labrum is a cup shaped rim of cartilage that lines and reinforces your ball and socket joint on your shoulder. Your ball and socket joint is composed of the gleniod, a shallow shoulder socket, and the humerus, which is the ball of your upper arm. Your labrum is a tough fibrous structure that deepens your glenoid socket, this helps hold you humerus in place when you rotate your shoulder. Your labrum also serves as an attachment point for you at your glenoid-fosse. So; when your labrum tears, your ball shaped humeral head has the possibility of sliding out of socket. Your rotator cuff consists of four groups of muscles and tendons . This group of muscles and tendons stabilize your shoulder joint and allow you to rotate and move your arm. The four muscles and tendons follow. There is the Supraspinatus, this keeps your upper arm stable, while holding your humerus in place. There is the Infranspinatus helps externally rotate your shoulder joint. Third is your Teres Minor, this also helps externally rotate your shoulder joint and works with other rotator cuff muscles to stabilize the head of your humerus in the Glenohumeral joint . Lastly is your Subscapularis. This muscle depresses the head of your Humerus to allow free movement when elevating your arm. All of these muscles work together to centralize the humerus bone, while doing different movements and stabilize your shoulder. So when you tear your rotator cuff you are tearing one or more of these muscles. If you have experienced one of these injuries in the past and would like to prevent it from happening in the future book an FMS screen today! Not sure what FMS is? Learn more here. Here at yoga Athletex we follow the LTAD model, which stands for Long Term Athletic Development. The LTAD model is a foundation for an optimal training, competition and post competition/ recovery for athletes training at every level. There are 6 steps to this training model, but today we are going to talk about step V.
LTAD model stage V: Train To Win. Stage V is for boys ages 18+ and girls ages 17+. Here at stage V, Athletes are maximizing fitness preparation and sport specific skills. The things athletes are to, or have already accomplished follow. First off the athlete’s personal, mental, physical, technical and tactical lifestyle capabilities are now fully established, so they are now shooting for maximal and optimal performance They are well equipped to achieve this because of their training of the LTAD model throughout the years. Training of these athletes are particular to weight and volume due to the possibility of overtraining. The athletes are still training for their sports specifically. All in all, training with the LTAD model reaps multiple benefits. For example, there are higher sporting achievements due to the planned out training style based on an athletes age. Another is less possibility of a burnout because of the diversity and versatility LTAD in training methods has to offer, especially at a young age. Finally is injury prevention. we can help prevent injuries caused by forced development or bad training practice because LTAD model will give coaches, athletes and parents the basic impressions on what the trainings should focus on.